Baby chicks are a symbol of Easter. They are born in the Spring and represent the renewal of life every year. I have read that people will sometimes give children live chicks for Easter. Live baby birds are never a good idea. Family members will often get carried away with the season and purchase live chicks, rabbits, and ducks as gifts, but these animals will often die or be given away to shelters when people tire of them. 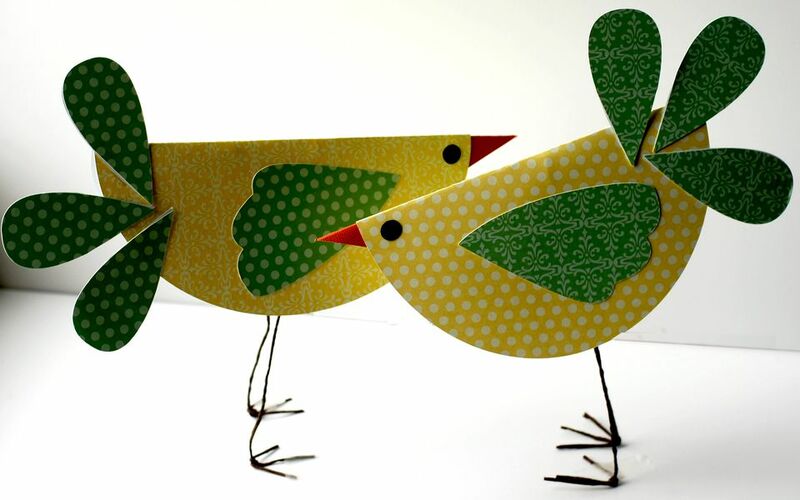 Why not make some of these cute paper chicks with your children. These chicks still symbolize the holiday, and don’t require any care! It is a craft that is quite easy. Children may need some help from Mom cutting out the chick parts (especially if you are using a digital die cutter), but assembly is a snap. If everything is cut out, small children can assemble the chicks in less than 15 minutes (with parental supervision) and get good results. Another plus to this craft is that it is not messy. Gotta love it! Make some Easter crafting memories that you and your children will treasure for years to come! Yellow patterned cardstock for chick body. Contrasting colored card stock for chicks wings and tail feathers. Cut out all of the parts needed to assemble the chick. If you have double sided card stock for the tail feathers, you only need to cut out three pieces. If you have single sided card stock for the tail feathers, you will have to cut out two pieces per tail feather. Use a glue runner to attach the two tail feather pieces back to back. Using a bone folder and ruler, determine the midpoint line of the yellow circle. Score the circle in half using the bone folder and ruler. Fold the circle in half and smooth with the bone folder. This piece is the body of the chick. Using a glue runner, glue the back of each wing section and attach one to each side of the chick. Fold the orange beak piece in half, run some glue along the top back edge and attach to the inside upper front part of the folded yellow circle. Attach tail feathers randomly to the back end of the paper bird. Wrap brown floral tape onto two 18 inch long pieces of floral wire. Tape the floral wire ( use ordinary scotch tape) onto the inside of the bird as in the photo above. The wrapped floral wire will be the birds legs. Make sure to bend each end forward one inch to give the bird some feet. To add some stability to the chicks feet, cut a piece of wrapped floral wire about 3 to 4 inches long. Wrap this wire around the bottom of the birds leg ( at the ankle) and form the feet as in the photo above. Use scissors to trim the feet evenly. Repeat this process on the other birds foot. These wires will help the bird stand up. If you can't get the bird standing up straight, use a little bit of tape on the feet to help stabilize the bird.